Besides managing search engine there are 19 webmaster tools that are part of the webmasters category which you can use to manage your websites. To try this category type the URL of your blog or website to use the tools in this category. When you search you will see a toolbar on top which will help you to select the webmaster tool you want to use. You can click on the icon or select the webmaster tool from the combo box. By default it uses the Wayback Machine. The various webmaster tools that are in fefoo range from SEO tools, domain management tools and stats tools. This tool allows you to see how the website has evolved over the years. You can see a snapshot of the website over the years. Use the command :wayback [domain name] to use it directly from fefoo. Only the keyword given in bold is required rest is optional. You can use this fefoo command from the fefoo homepage. 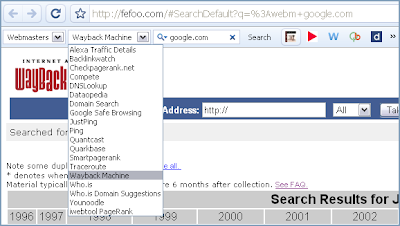 Now you can also add fefoo to your browser and use these commands from the search bar. You can add this firefox add-on to add it to firefox. For other browsers follow these instructions. This is a great utility if you want to see if your website is available across the globe. They have servers around the world and you can ping from those servers to find out if your website is working from there. fefoo command :justping. There are 4 DNS based tools that you can use from fefoo. There are three tools which you can use to find the page rank of your website. You can use any one of them if either of them is down. If you have set your homepage to http://www.google.com/ig you can now add fefoo to your homepage. You will be able to search on any of the 250+ search engines in 40 different categories right from your homepage. Click on the button to add it to iGoogle now.